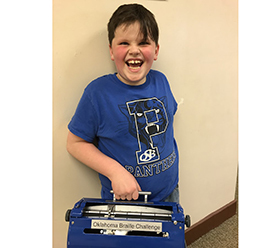 Oklahoma School for the Blind fourth-grader Hunter Kelley from Claremore shows off the Braille Writer loaned for his use due to his success in the Braille Challenge® in February 2018. He also earned top honors and a gold medal. Kelley placed 3rd in his grade level at the national competition in 2016. OSB organizers will include the Braille Institute’s 100th birthday as part Braille Challenge activities. Oklahoma competitors who score among the top 60 nationally will advance to the national Braille Challenge competition in Los Angeles in June. “I appreciate the Braille Challenge Coordinator Faye Miller and her many volunteers for all of the work they put into making the event successful,” Echelle said. Participants in first through 12th grades compete in five contest categories: apprentice, freshman, sophomore, junior varsity and varsity. Each category is designed to test braille skills in several areas—reading comprehension, braille speed and accuracy, proofreading, spelling and reading tactile charts and graphs. Contests are proctored by teachers for visually impaired students and scored locally by volunteer transcribers, according to the Braille Institute’s national guidelines. Contestants will receive brailled certificates of appreciation, commemorative t-shirts and gift bags with donated prizes from local and national sponsors. Braille Institute staff will share feedback about each contestant’s performance with families and educators in May. Braille is internationally recognized as the foundation of literacy for students whose visual impairments prevent efficient use of print. It enables them to learn and practice spelling, punctuation, composition styles, and research and study skills. Cornell University research indicates that 44.5 percent of Oklahomans with visual disabilities, ages 21 to 64, are employed, while the National Library Service for the Blind and Physically Handicapped reports that nationally 90 percent of blind jobseekers who beat the employment odds are braille readers. For more information about Braille Challenge®, contact Faye Miller at fmiller@osb.k12.ok.us or 918-781-8200. Oklahoma School for the Blind is the statewide resource for the education of blind and visually impaired students. Residential and commuter students meet all state-mandated education requirements and receive specialized instruction in Braille, orientation and mobility, optimum use of low vision, adaptive equipment technology and tactile graphic skills not readily available at other public schools in the state. The school has maintained 100 percent graduation rate for five years. OSB also provides hundreds of hours of free evaluations and other direct services each year for students attending local public schools, their families and local school staff. OSB is a division of the Oklahoma Department of Rehabilitation Services.